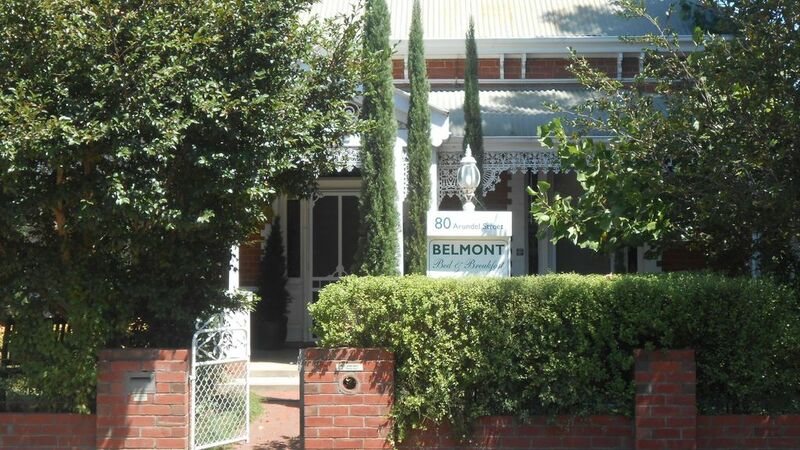 Belmont (c.1900) is a charming old Victorian home with exquisite decor and antique furnishings, ideal for a quiet relaxing stay in romantic surrounds reminiscent of a bygone era. Close to excellent restaurants and streetside cafes, it is a short stroll to the Rose Gardens with the Weary Dunlop Memorial Statue and Regional Art Gallery or a walk around Lake Benalla to follow the Ned Kelly plaques of interest. Benalla has added another aspect to its reputation as an arts centre with a wide range of street art by prominent painters on several external building walls across the town. Tourism has been given a great boost with this artwork, its reputation growing rapidly. Benalla enjoys a reputation for its gliding activity and finds itself as the centre for conduct of the 2017 World Gliding Championships with teams of gliders from across the world gathering in Benalla in January 2017 to compete with the best in the world. while a few minutes further along the Hume Freeway is the gourmet food and wine gourmet corridor of the King Valley, stretching from Milawa with Brown Bros. winery, Milawa Mustards and cheese factory down towards Whitfield with Pizzinnis winery and great eating houses. Extremely well presented,first impression great. We had a loveley stay at Belmont, our hosts Bill & Carolyn were great.Very welcoming, nothing was a bother, even to lighting that great open fire in the lovely lounge. I would recommend it highly. Ian and Betty were the type of guests that make running a B&B worthwhile. It would be great to see you back again when we could enjoy another night together with Rob and Maxine. .
We were two couples staying for two nights at this very comfortable and well-appointed B&B. Our hosts Bill and Carolyn were most helpful with suggestions for dinner and sights to see. Based in Benalla we were only 30 minutes drive to Beechworth and surrounds and it was lovely to be able to come back in the evening after dinner and sit in the private lounge by the fire.